Welcome to my site! I’m glad you are here. Here’s a bit about me. My name is Christina. I developed my passion for food and travel growing up in Seattle, WA. As a baby, I would sleep under banquet tables during my Mother’s catering gigs. I basically grew up in the background of the retail food business. During high school, I worked at the famous Red Mill Burgers, making milkshakes and working the register. I traveled to Florence, Italy, while attending Arizona State University and fell head-over-heels in love with Italian cuisine. After visiting Paris, Parma, Argentina, India, Austin and New York, travel began to inspire and influence the flavors in my kitchen. In 2011, I launched the Foodie with a Life blog, showcasing simple gourmet dishes for foodies with no time to cook. I now live in a studio at the base of Queen Anne Hill. 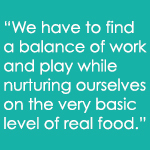 I teach yoga and work a full-time job, and I’m often cooking deep into the night. Love your blog and all the beautiful foodie posts! I nominated you for the Liebster Award, which is a great way to connect with other growing bloggers. Check it out at http://thenenja.wordpress.com/2013/09/10/liebster-award/ and I hope you participate! Saw your recipe on KCTS and immediately tried to find your blog with success. Moved to Seattle a little over a year ago and have been looking for local bloggers. I am over 70 have psoriasis and need to lose some weight and love to cook but always end up with to much food only cooking for one. Any help would be appreciated. Am looking forward to reading your blog and the recipes. Will try the chick pea salad. Thank you for being on the show. I love KCTS. Hey I just found your blog, and it is sooo cute! I’m following you now and I can’t wait to read more of your posts!